The Velscope is an early oral cancer detection device, used in combination with traditional oral cancer examination procedures. The Velscope allows your health care professional to visualize mucosa (tissue inside the mouth) abnormalities that may require biopsy. Velscope, by detecting pre-cancerous lesions early, may save thousands of lives. Every hour of every day, oral cancer kills someone in the U.S. In the past 30 years, there has been a 60% increase in oral cancer in adults under the age of 40. Oral cancer is the only cancer that has not shown a decrease in the mortality rate in over 30 years. 48% of patients diagnosed with oral cancer, die within 5 years. Early Diagnosis will save lives and if caught early enough….the 5-year survival rate can be as high as 81%. Existing screening protocol usually finds potentially abnormal cells only on the surface (visible to the eye). Currently, almost 2/3 of oral cancer cases are diagnosed in the late stages. Velscope can show abnormal tissue below the surface, even before they become apparent to the clinicians eye. This is a huge benefit because oral cancer found in its early stages can increase (by 81%) the survival rate. A dentist can use the velscope as a screening tool to allow a more informed decision in determining whether an area of suspicion should be biopsied. This is nice for the patient because it eliminates the need to biopsy something that is benign. Fluorescence is the energy expelled by cells after absorbing a high energy input before they return to their normal energy level. Velscope emits a safe, high energy blue light that excites the tissues beneath the surface down to the basement membrane. As the tissues return to normal energy levels, the tissues re-emits the absorbed energy in the form of fluorescence. Special optical filters in the Velscope hand piece enable the clinician to immediately view the different fluorescence patterns emitted by the tissue, which can be used as an additional diagnostic tool to help differentiate between normal and abnormal cells. Typically, healthy tissue shows up with a green glow and the abnormal suspicious tissue may cause a loss of fluorescence and thus appear dark. 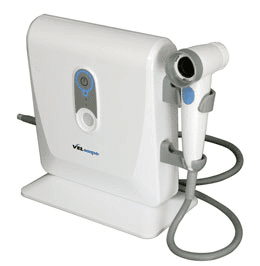 The Velscope examination takes less than 3 minutes and does not require any rinses or stains.